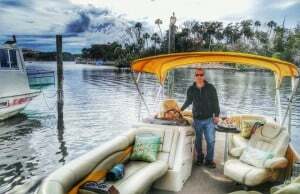 Captain Sean, a Homosassa native, operates Mellow Mangrove Charters. 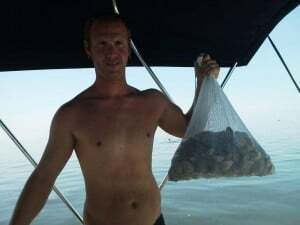 Captain Sean has a laid back personality and knows just where the scallops hide. 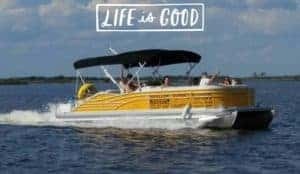 Mellow Mangrove Charters provides 6 hour scalloping trips at $89 per person on our luxury VIP vessel. 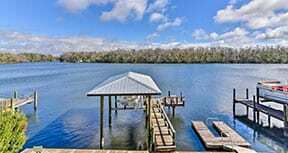 We meet at Wild Sassa Seafood, 5380 S Boulevard Dr, Homosassa, FL (next to Shelly’s Seafood). 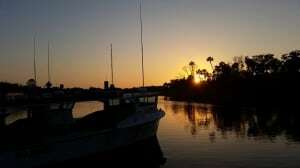 We offer two trips daily: the morning trip leaves the dock at 7 am and returns at 1 pm and the afternoon trip leaves the dock at 1 pm and returns at 7pm. For a truly unforgettable experience, Wild Sassa Seafood can also cater your scallop adventure (Menu can vary depending on market). 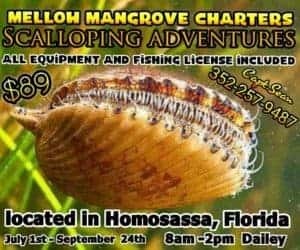 Please call 352-257-9487 or reserve via Facebook at Mellow Mangrove Charters. Scallop hunters should bring a towel, sunglasses, sun block, and a lunch. BYOB! Mellow Mangrove will provide all snorkel gear, bottled water, and a great time. 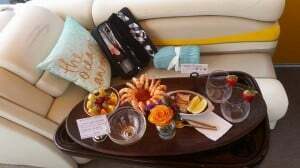 Mellow Mangrove Charters also operates a sunset cruise. Tour depends on time of sunset, and are 3hrs in length.